Due to the popularity of the phenomenal Microtubes 900 amplifier, Darkglass have decided to step things up a notch. 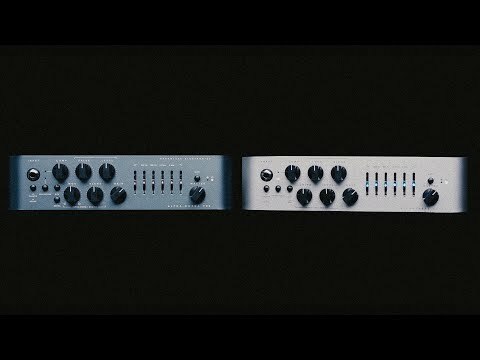 Introducing the Darkglas..
Due to the popularity of the phenomenal Microtubes 900 amplifier, Darkglass have decided to step things up a notch. Introducing the Darkglass Electronics Microtubes 900 v2 900w Bass Head - a versatile, uncompromising, and unapologetically loud amp that you're going to want in your rig! With the original Darkglass Electronics Microtubes 900, players were finally able to access those fantastic Darkglass bass tones in amplifier format. For the Microtubes 900 v2, Darkglass have tweaked their original design to take things to the next level entirely. As opposed to the standard control pot EQ design on the original, the Microtubes 900 v2 comes complete with 5 EQ sliders. These sliders allow you to cut/boost up to 12dB of Bass (80Hz), Mids (250Hz, 500Hz, 1.5kHz, and 3Khz), and Treble (5kHz), fine tuning your tone with pit point accuracy. This Push button switch will turn your Microtubes Engine on or off. This engine adds natural compression, organic harmonic enhancement, and saturation that ranges from a mild overdrive, to all-out high gain mayhem. Thanks to the Blend control though, you can have this overdriven signal running alongside a clean signal, ensuring that none of your articulation is lost. Two of the most popular overdrive circuits amongst bass players both come from Darkglass - the Microtubes B3K, and Vintage Microtubes. Both of these circuits are integrated into the Microtubes 900 v2, with a Push Button switch allowing you to choose between them. The B3K is renowned for its aggressive, percussive overdrive sound. On the other hand, the VMT boosts your mids, and delivers a warmer, more neutral character. Whether you want to connect a 350w 8Ohm cabinet to your amp, or up to 900w at 2Ohms, this amp can handle it in style. You have options to connect to an external power amp, thus bypassing the one built in, or even connect your power amp to an external preamp. If that wasn't enough, you have XLR DI sockets for both Pre and Post DI, allowing you to send either a clean or Microtubes processed signal to a console, mic preamp, interface etc. In addition to this, there's a USB socket, which lets you connect the Microtubes 900 V2 up to your home PC. Once connected, you can use the free Darkglass Suite software to edit parameters, and even upload new Cabinet Impulses, allowing you to achieve your ideal tone with ease. There's also a MIDI input, which allows you to control the amp channels via a MIDI standard controller. The Darkglass Electronics Microtubes 900 v2 900w Bass Head brings together everything the modern, professional bassist could need. What's more, it delivers it in a compact, sleek, and loud format. Contact your local PMT Store today if you'd like to query the availability of this incredible amplifier.